SADLY, cup competitions have been sent down most clubs’ list of priorities, a trend that seems to now include the devaluation of the FA Cup and even the Europa League. The Herts Senior Cup may not be very high on any manager’s wish list, but in a county as footballingly diverse as Hertfordshire, finishing top of the pile in a competition that includes Watford, Barnet and Stevenage is no mean feat. Admittedly, Colney Heath, Sun Sports, Sawbridgeworth, Eton Manor and St. Margaretsbury represents the other end of the scale, but you’ve still got to beat them. Hertfordshire’s senior competition dates back to 1886-87, when Hoddesdon beat Watford Rovers 5-2 in the final. 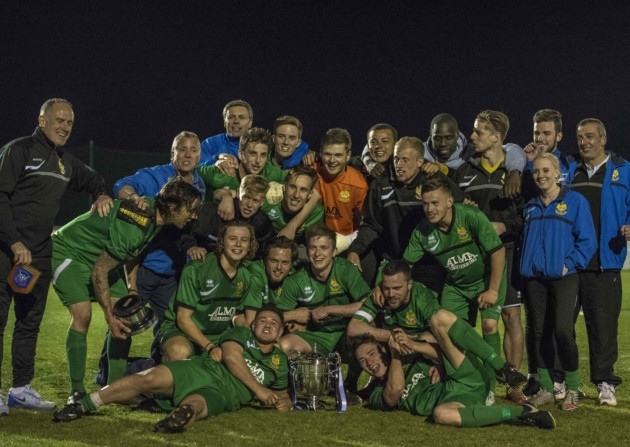 The competition used to have far more gravitas than it does today, invariably taking precedence over most other games, but for Hitchin Town and Boreham Wood, it was a chance to end the 2015-16 season with some silverware. And it is a decent piece of objet d’art, a classical silver trophy that has a rich history. If you’re in the final, you may as well try and win it. 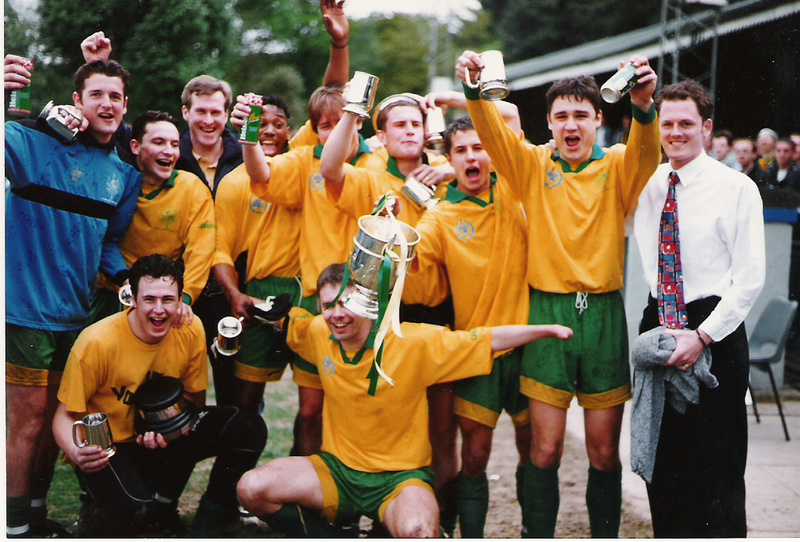 Hitchin certainly wanted to win the cup for the first time since 1997 when, ironically, they trounced Boreham Wood 4-1. To make for a decent piece of copy, manager Mark Burke was Hitchin’s skipper that day. Indeed, he even scored a goal – a rare feat in his long career. But there were a few hurdles for Burke and his team. First of all, the Canaries had suffered a morale-bashing play-off defeat at home to Hungerford a week earlier – after being 2-0 ahead. Furthermore, their opponents, now a National League club, had staved off relegation in their first season at that level. So they were buoyant. Cheshunt was the location, a strange choice given the wealth of half decent grounds in the county – Barnet, Watford, Stevenage and St. Albans. But Cheshunt it was, and having found your way there, the Herts FA decided to charge £12 admission. Given the final is hardly a huge attraction, and with football on the TV, they did themselves no favours from a PR perspective. In some respects, having lured two sets of fans to Cheshunt (14 miles from Boreham Wood, 32 miles from Hitchin), nobody was going to baulk at the price, but it just played to the theory that non-league is too expensive. Boreham Wood’s rise to the National League is remarkable and down to the drive and acumen of one Danny Hunter, a permanently tanned and snappily-dressed businessman whose family seem to run everything at Meadow Park. It’s a great set-up at Boreham Wood these days and they’ve even managed to attract more fans along to a ground that was often sparsely populated in the past. A few of them turned up at Cheshunt, although Hitchin’s following – for them, a much bigger game than for Boreham Wood – outnumbered them. True to form, the Canaries’ supporters expected a drubbing. “If we get away with 3-0 we will be lucky,” said one veteran fan. He was right to be cautious, but this Hitchin side has been proving the doubters wrong all season. They did it again in the early stages of the game, scoring after just four minutes as Josh Bickerstaff teed-up Liam Brooks to drive home. Boreham Wood settled down and gradually took control and it was no surprise when they equalised after 16 minutes, Billy Clifford shooting high into net. Clifford almost added another when his free-kick took a deflection and struck the woodwork. The second half was more interesting, and it was clear that Hitchin were not going to buckle under Boreham Wood pressure. Ten minutes into the second half, they were awarded a penalty after some shirt-tugging in the area, but Lewis Rolfe’s spot kick, after a bit of gamesmanship from complaining Boreham Wood players, was really sub-optimal. “Another missed penalty, time for someone else to have a go,” said a Hitchin fan, complaining about Rolfe’s record from the spot. At that point, we were discussing who might be Hitchin’s player of the season. Dan Webb’s name kept coming up and in the 64th minute, who else but Webb sent a looping header against the cross bar and behind Boreham Wood goalkeeper James Russell. 2-1 to Hitchin and Webb looked very pleased with himself! Four minutes later, a nasty tackle by Dave Stephens, a player that has just committed himself to Boreham Wood for next season, earned two yellow cards and he was off. For a while, the National Leaguers were scrapping, arguing and trying to out-muscle Hitchin, earning some sarcastic comparisons with Tottenham’s performance at Chelsea a few days earlier. Boreham Wood, now realising they could be beaten by a team from two divisions lower, started to attempt a comeback, but they were too hesitant in front of goal and lacked the necessary punch. Hitchin deserved their victory – a little compensation for that play-off gaffe. What next for Hitchin? Well, victory in Cheshunt meant they go straight into Europe. Yes, Europe. As you read this, the team are sunning themselves in Spain. Who said the Herts Senior Cup doesn’t have its rewards? Unfortunately, it is the case that Cup Competitions in general have taken lesser priority in recent years. But as far as this Cup Final was concerned we simply wanted it more than Boreham Wood in my opinion. The picture above says it all.